Financiers (pronounced fee-nahng-syehr) are lovely dome-shaped French tea cakes (cookies) with a soft and springy texture that taste of caramelized butter and almonds. The edges of these cookies are nicely browned and I love to serve them warm from the oven with a hot cup of tea. Dorie Greenspan in her excellent book Paris Sweets tells us that Financiers were first made in the late 19th century by a pastry chef whose shop was close to the Paris Stock Exchange. He baked the Financiers in rectangular molds that were said to resemble bars of gold. While you can buy special Financier molds to bake these cookies, I just use either individual tart pans (molds) or a miniature muffin tin. The batter for Financiers is made by combining flour with ground almonds and powdered sugar. To that is added lightly beaten egg whites, vanilla extract and brown butter (beurre noisette). Brown butter is just clarified butter which has been cooked until the milk solids have dropped to the bottom of the saucepan and turned golden brown. This butter gives the Financiers their rich caramel flavor. Since you need to see the butter browning, make sure to use a light colored saucepan. While not difficult to make, if you prefer, you can replace the brown butter with 1/3 cup (80 ml) of melted unsalted butter. Once the batter is made it can be covered and stored in the refrigerator for a few days. Financiers are delicious plain but are especially pretty when topped with raspberries, blueberries, thin slices of strawberries, or even blackberries. The berries are placed on the top of the Financiers about halfway through the baking time to prevent them from sinking. Place the butter in a small light colored saucepan over medium heat. Once the butter has melted let it come to a boil, swirling the pan occasionally. As it boils you will notice that a foam will appear on the butter's surface. Continue to cook the butter until it looks clear and the milk solids have dropped to the bottom of the pan and have turned golden brown. Remove from heat and immediately pour through a cheesecloth-lined strainer. Let cool to room temperature. You will need 1/3 cup (80 ml) of brown butter. Use the leftover brown butter to butter the molds (use a pastry brush). In a large bowl whisk together the flour, ground almonds, confectioners sugar, and salt. Make a well in the center and fold in the lightly beaten egg whites, vanilla, and the brown butter. Fill each mold almost to the rim and bake for about 4 minutes (batter is set around the edges but still soft in the center). 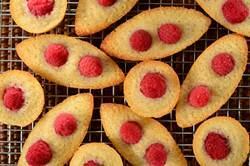 Remove from the oven and gently place one or two fresh raspberries on top of each. Bake a further 5-7 minutes or until the Financiers have become golden brown around the edges and are springy to the touch. Remove from oven and let cool on a wire rack. These are best eaten warm from the oven, but they can be covered and stored for a few days at room temperature or in the refrigerator.